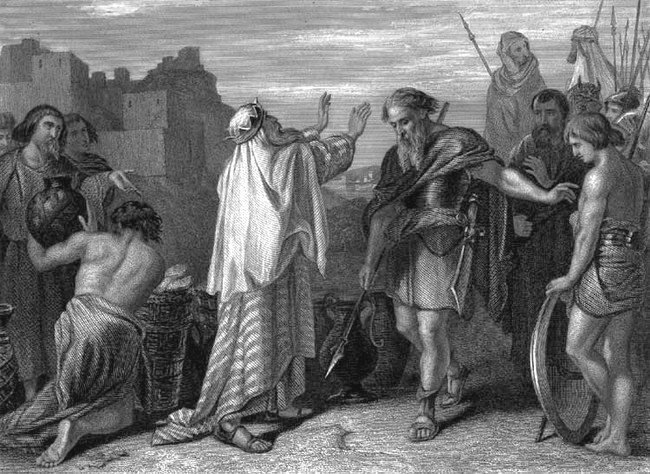 The meeting of Abraham with Melchizedek. Download the PDF file of this article. (Then save it to your tablet). The righteous rule of our Lord Jesus (as King of kings) and His priestly ministry (as High Priest and Sacrifice Lamb), is showcased in the dual offices of Melchizedek. (See Ps.110:4) Jesus Christ/Yeshua Hamashiach presides over His creation as Christ, the Anointed One, and our coming Messiah. Through these two offices of Melchizedek He currently ministers and rules in the hearts of His covenant people as both priest and as king. Two thousand years ago He came in His priestly role as the Suffering Servant. But in the fullness of time Messiah will return as King of kings. On that Day, the Day of the Lord, He will judge the wicked. He will deliver His people, Resurrect and Rapture His saints, restore Israel, and establish the long awaited Millennium of Messiah. The consummation of this age will see Him come to rule and to minister from Jerusalem all across and around this world. Here is how this will happen. The kingdom authority of the Throne of David, and YHVH-God's righteous rule which is in the royal Jewish tribe of Judah, is the spiritual heritage and burden of the Jewish nation. The priestly authority of the Gospel of Grace in the New Covenant, (which was given early on in Jeremiah 31:31-33 and set forth by Messiah in the Great Commission), is the burden of the Church. Both of these anointings and authorities belong to the Order of Melchizedek. And here on earth they complement one another in Christ. This unity will establish the long awaited and much prayed for "Peace of Jerusalem". And out of this union in Messiah will come true the genuine 'Peace on Earth and good will among men'. The priestly anointing of Messiah presents Him as our High Priest and Saviour. (Heb.4:14). And in His royal kingdom anointing we see Christ as the coming "Lion of the Tribe of Judah". (Rev.5:5) The coming Messiah of Israel is destined to become King of Kings over all this earth. (1Tim. 6:15) "And the government shall be upon His shoulders". (Isa.9:6) The Anointed One, (Gr. 'Christ' or Heb. 'Messiah') will re-enter world history. He will triumph over the forces of darkness at His second coming. Then He will minister as priest and as king, overseeing both these offices in the coming Millennium of Messiah. Right now this dual authority is being shared across the world via the Gospel. Quietly and individually human hearts are being changed as soul by soul and silently they enter into the depths of the New Covenant. (Jer. 31:31) Messiah is being established on both the throne and the altar of human hearts. The indwelling Christ or Messiah is the divine empowerment and the anointed agency doing the work here. As High Priest of the Order of Melchizedek He establishes His altar in the lives of His covenant people thus bringing His ministry of grace. And as the indwelling King of kings He establishes His Throne, the Throne of David, and the righteousness of God in the lives of His covenant people. And "unto Him is the gathering and the obedience of the people". It is in the gentle bonds of Agape love that His righteous rule is established within human souls. But the Order of Melchizedek is destined to go out beyond the lives of individuals. The Ministry and Rule of Messiah is prophesied to become an international reality in future World history. His Kingdom Rule and the Ministry of His High Priesthood are the dual offices that will be at work in the world during that glorious future time. Both of these authorities of Melchizedek in Messiah, the political and ministerial, will emerge under the auspices of our coming Messiah. The end-time ministry of the House of Joseph will be a key to all this. The true Church, as a wild olive branch, will be cleansed of her antinomianism and lawlessness. They will see, at last, that they are the wild olive branch and that they are being grafted back into Israel. (Rom.11:13-27) The scattered lost sheep of the House of Israel will be regathered. (Rom.11:25) And the Light of Israel will go out to the nations. Under Joseph and Benjamin the Cup of Messiah in the true Church will bring in the fullness of the Gentiles. The end-time harvest will be gathered in as a great multitude from the ends of the earth. These decisive and final events in the holy history of this age will come in the midst of the climactic latter day outpouring of the Holy Spirit. This was seen by by the prophet Joel climaxing in the 6th seal cosmic disturbances of a darkened sun and a bloody moon. (Joel 2:28-32). BACK IN THE DAYS OF ABRAHAM. HE ALONE CAN FULFILL THIS OFFICE! Melchizedek was a real person who lived during the time of Abraham about 2,000 B.C. He was a righteous and Godly leader over a very special piece of real estate, the ancient city of Salem, the city of God's Peace, later to be known as Jerusalem. He was an early priest-king and in the manner of many early leaders of those times. He presided over both the religion and the politics of his city. The significant thing about Melchizedek was not only the place of His rule and ministry, which was over the "Holy Place", but that he operated in two offices as both priest and king. Melchizedek has been recognized as a "type" or a forerunner of our coming Messiah who as we know presides eternally over this cosmos and its people in those dual mutually supportive offices as High Priest and King of Kings. As we read the account in Genesis 14:18,19,&20 we see that our patriarch Abraham gave Melchizedek tithes and Melchizedek blessed Abraham and his family. Melchizedek also brought out bread and wine which are the constant and continuing elements of a covenant meal among the covenant people of the God of Israel. The bread and the wine are the elements that are still laid out before us in our Christian communion services today. Here are the three verses from Genesis giving us the bulk of what we know about him Biblically and historically. he was the priest of God Most High. Here are some general principles and some conclusions we can draw out from these three verses. 1. The Order of Melchizedek has two offices or ordained authorities of operation here on earth, those being a kingdom and a priesthood. The two are not independent of one another. As we shall describe later on in this article, both authorities operate in harmony and unity in a mutually supportive communion. 2. The communion of the Most High God is entered into by faith and flows out of a two way blood covenant which a person of faith makes with the High Priest and King who ministers and rules in the Order of Melchizedek. 3. The homage and the tribute, which includes the tithe, are owed to the One who rules in righteousness and ministers in grace in the Order of Melchizedek. 4. Those who are truly in the family of Abraham will recognize and respond to their Messiah as King and High Priest of their lives. And they will voluntarily and out of their heart give Him a tenth of all that comes to them. 5. The blessings, the honor, and the anointing of God Most High flow out whenever a member of Abraham's family of faith enters into communion and makes covenant with the Priest-King who legitimately ministers and rules in the Order of Melchizedek. 6. The Holy City is Jerusalem belongs to the Kingdom and the High Priesthood of the Order of Melchizedek. Accordingly it should never be divided by presumptuous world leaders or profaned by godless pagans. 7. Jerusalem, the City of Peace, is holy and set apart to God Most High. Messiah is the righteous King of Salem and High Priest of God Most High. The Order of Melchizedek will be seen in Christ when He returns to this earth as Messiah. There will be an apocalyptic conflict centered around Jerusalem as He returns. And why will this be happening? In the latter days the Holy City will be trampled by raging heathen nations. (See Psalm 2) The Holy People will enter into Great Tribulation during this very same time period. When that happens there will be a Messianic intervention. At the close of this age our coming Messiah will be unveiled in all His glory in the apocalypse and He will deliver Jerusalem at Armageddon. Returning to His Holy People as "The Breaker" He will deliver His Congregation who are in exile as the sheep of Bozrah. (Micah 2:12,13) He will smash the armies gathered against His Holy City of Jerusalem as they muster in the Valley of Jezreel or Armageddon. Then He will judge the nations and issue His passport into the 1,000 year Millennium of Messiah at the sheep-goat judgment. There is no doubt about it. Messiah's Second Coming will be decisive. His dual offices in the Order of Melchizedek will be established for all eternity. And the long awaited Peace of Jerusalem will finally come. The Order of Melchizedek will ultimately be seen in our Lord Jesus Christ. This dual anointing belongs to Him exclusively. And all legitimate authority comes from Him and Him alone. Yeshua Hamashiach,our coming Messiah, is the true and only Anointed One. How do we know this? "... a priest forever according to the Order of Melchizedek". Psalm 110 - A Psalm of David. 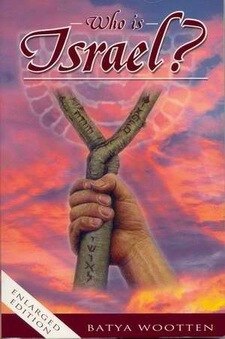 2 The LORD (YHVH) shall send the rod of Your strength out of Zion. You have the dew of Your youth. According to the order of Melchizedek." IN THE CRUCIBLE OF THE END-TIME DRAMA. Prints available at the Israeli Poster Center. 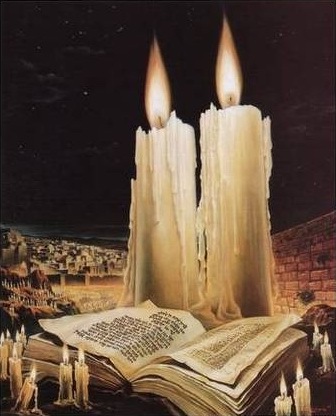 The two witnesses are showcased in the two Shabbat candles. And two candles are presented on our dining tables in Christendom. The theme of 'two witnesses', God's Grace and His Righteous Rule (Torah/Law), is seen throughout both Old and New Testaments. Melchizedek, as king of Salem (peace), was also priest of God Most High. So our Messiah as a priest/king in the Order of Melchizedek has dual offices or authority. He rules in the priestly or religious realm ministering to men in order to bring them into union with God. Melchizedek also bears rule in the royal kingdom authority of the Throne of David. The burden and anointing for God's righteous reign is centered in the royal (Jewish), House of Judah. Our coming Messiah, our Lord Jesus Christ, is therefore both priest and king. This is a very important point and the key to our understanding of what eventually happens in the end-time drama and the latter day reconciliation between the Church and the Jewish nation in Israel. A word study through the scriptures of the word "elect" reveals that there is one Chosen people. The Church (or Congregation) of Yeshua Hamashich/Jesus Christ will enter the crucible, along with the nation of Israel. There they will both to enter into refinement to emerge as a single remnant Elect. The scriptures above clearly show us the dual anointing in the Order of Melchizedek. And we can plainly see that there is no division and no dispensational separation. The wall of partition between Israel and the Church is artificial. It has been crafted by Freemason dispensationalists. They have infiltrated the Church and are trying to set the end-time agenda against the true and faithful witness of God Most High. The Church-Israel partition is like a brick wall running right through a house. It is a man-made work of masonry. The dispensationalism we see in the evangelical family separates Israel from the Congregation/Church of God Most High. This may reflect present day religious reality. And the present day convenience of the troll-like principalities and powers try to keep and preserve the status quo. But our "us and them" dispensationalism does not describe the true and genuine future eternal reality that this world will see established forever by our returning Messiah. Ezekiel demonstrates the this dual authority in Ezekiel 37. Messiah's dual authority in the Order of Melchizedek comes with the stick of Judah and the stick of Joseph! Our returning Christ, the Messiah, the Anointed One, carries BOTH of these! The two sticks of Ezekiel 37 are united as one is in His hand! So what is the message here that we are not hearing in Church. The Breach of Jeroboam will be healed. End-time holy history will see ALL of God's covenant people as ONE BIG REUNITED HAPPY FAMILY regathered from BOTH houses of Israel. They will come together as one single undivided remnant Elect. God says that His covenant people are chosen in the furnace of affliction. Israel and the Church will both go into the crucible of the 70th week together during those last 7 years of this age. In this process Messiah, performing His wonders inside His saints and inside His nation will bring both houses of Israel into confluence and unity. Will the Congregation of Israel, (the Church), and Israel in the Jewish House of Judah be united by politics or ecumenical efforts of well-meaning and ambitious churchmen? No, not at all. How does God say this union of the Kingdom and the Priesthood under Yehoveh-God will come about? until the fullness of the Gentiles has come in. This brings us a very important message. Our Apostle Paul, is opening up this mystery. He says that it is important that we are aware of it. 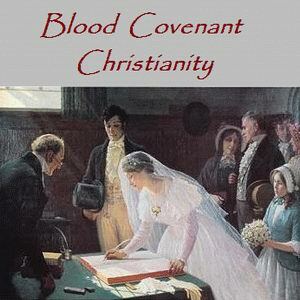 The Church has quite obviously entered into the Eternal Covenants of Israel. (Eph.2:12-13) The Church is hidden in covenant with the Messiah of Israel. As a hidden part of Israel then we can see that the Church is just as much in partial blindness, (of her identity in Israel), as the nation of Israel is in partial blindness of the Messiah of Israel. BOTH are partially blind! Our Apostle Paul tells us that this partial blindness will continue until the end of the age when the church has finished her job in the harvest fields and the "fullness of the Gentiles" has come in. At this late time in history, the scales will come off the eyes of Israel, in both houses. Judah, and lost Israel, will finally "see" and recognize their Messiah, Jesus/Yeshua. They will repent and be reconciled to Him. And the Church will "see" and finally recognize their true national identity in the Commonwealth and citizenship of Israel. (See this very important and yet hidden passage of Scripture, Eph.2:12-13) The mystery as to what has happened to the lost 10 tribes of Israel, (who were taken into captivity by the Assyrians in 722 B.C. ), will finally be revealed at that time. 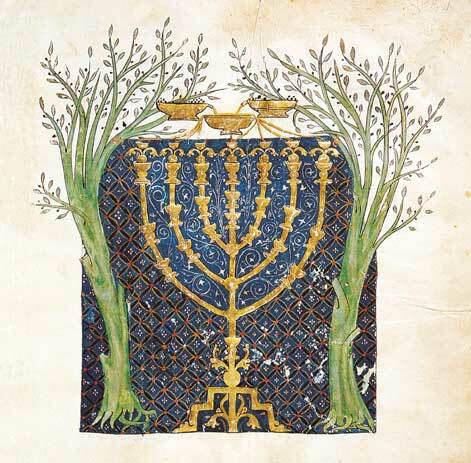 VISION OF THE TWO OLIVE TREES OF ISRAEL. is from the Jewish Cervera Bible. Here is another clue from the prophecy of Zechariah in which specific mention is made of two anointed ones who stand before the Lord of the whole earth. They must relate to the dual anointing of the God of Israel. Our scripture passage is in Zechariah chapter four. Zecharaiah saw two olive trees. Both of them were supplying the oil of anointing to a bowl. That bowl supplied oil to a seven branched candlestick or candelabra. Here is our scripture. Not by might, nor by power, but by my Spirit, saith the LORD of hosts'. upon the right side of the candlestick and upon the left side thereof? which through the two golden pipes empty the golden oil out of themselves? 13 And he answered me and said, Knowest thou not what these be? And I said, No, my lord. that stand by the Lord of the whole earth." In Romans 11 our Apostle Paul speaks again of olive trees. We hear of "natural branches" and "wild branches". This is in reference to Israel and the Church. Clearly both are identified with the olive tree. And the olive tree is a symbol of Israel. AND DURING THE BATTLE OF ARMAGEDDON. It has been a long time coming, and many would consider it impossible, but the Jewish nation will at some point come to accept their Messiah, Yeshua Hamashiach and so come to be 'born again'. They will receive the salvation Messiah offers in the blood He shed at Calvary. He is the Sacrifice Lamb prophesied from of old and "slain from the foundation of the world." - Rev.13:8 The prophet Zechariah tells us how and when this epic and climactic national salvation of Judah will happen. It would appear that their spiritual salvation will occur at the very same time as their military salvation. The armies of the gentile nations will muster on the huge plain of Megiddo northwest of Jerusalem. They will go up to encircle and try to take Jerusalem. At that moment it will seem that all is lost. But then suddenly an earthshaking event will occur. Just as the Jewish nation is repenting and calling out to the One whom they had rejected for so long He will return. Their Messiah will suddenly be at the door! There will be a magnificent deliverance and the surrounding armies of the nations will be struck down. This awesome period of history is well known as the Battle of Armageddon. It is an important vignette of the Second Coming of Christ. 12:7 "The Lord will save the tents of Judah first, so that the glory of the house of David and the glory of the inhabitants of Jerusalem shall not become greater than that of Judah. 12:8 In that day the Lord will defend the inhabitants of Jerusalem; the one who is feeble among them in that day shall be like David, and the house of David shall be like God, like the Angel of the Lord before them. 12:9 It shall be in that day that I will seek to destroy all the nations that come against Jerusalem. 12:10 "And I will pour on the house of David and on the inhabitants of Jerusalem the Spirit of grace and supplication; then they will look on Me whom they pierced. Yes, they will mourn for Him as one mourns for his only son, and grieve for Him as one grieves for a firstborn. As we can clearly see here in this passage, the Battle of Armageddon will be attended by the long awaited salvation of the House of Judah. The climactic corporate and national salvation of the Jews will be a stupendous event. They will undergo a massive conversion to Jesus/Yeshua. This will be happening just as the fullness of the Gentiles is brought into the Church. This will be the climax of the history of this age. Nothing further can or needs to be done before Messiah returns in wrath on His enemies and deliverance of both houses of His Elect people. The whole nation of Israel will be saved. It will be spiritually and nationally born in one day as a royal priesthood and a holy nation. -Exod.19:6, 1Pet.2:9. The prophet Isaiah was incredulous when he saw it. The Breath of God's Spirit will come into Judah at last. The coming in of this host of Jewish Messianic Christians will bring great enrichment to the Church. - Rom.11:15 The natural olive branches will be grafted back into the olive tree alongside the wild ones that were grafted in earlier. - Rom.11:23 The scales will come off the eyes of God's covenant people in the Church as well. Wild olive branches are still olive branches! In that Day they will realize that they are in the olive tree of Israel. This has been very difficult for Christian believers to grasp. At the present time we read about it in Romans 11 and we scratch our heads. We partially receive the message. But we do not really "see it" clearly just yet. It is a hard thing for us to grasp with our oaths of national allegiances such as we have them today and with our national flags resting in our churches. Over in the other house an epic repentance and national salvation is destined to occur. Yes, the national corporate salvation of the Jewish nation will surely come. This will happen very late in history. But come it will. The prophet Zechariah tells us about it. (Zech 12:7-13:1) Up ahead our Jewish brothers and sisters in the royal house of Judah will be joining us in the Body of Christ, the wider Commonwealth of Israel. So, all that being understood, can we exercise some patience here? Can we wait for them as they come home? Do we have to entertain false notions of avoiding the end-time witness? Why are we preparing to act on this shameful carnal impulse to desert the ship Why are we fancying ourselves turning our backs on our Jewish brethren and skipping out early? And here is another question. Can we be sure we in the Church not be present during those final 7 years? Shall we not be here on earth to finish up the witness for our Messiah? Shall we not be here to witness the unfolding of the "greater works" that attend the outpouring of the Holy Spirit at the climax of the age? Did not the Master of Ceremonies at the Wedding Feast at Cana speak of the best wine being preserved and held back until the very end? Yes, the thick darkness of the midnight hour will surely come. But the lamps of the wise virgins will still be burning. Their lamps will not go out. The wise will have the extra outside supply of oil of anointing and oil of illumination. And with the oil of gladness they will be given "a song in the night". Our God will pour out of His Spirit during those awesome future times. And He will perform wonders that have never been seen before. That is the Way of our God. So do we really want to agree with those who declare that we in the Church will not be here? Do we have any scriptural authority to teach this? Or is it just a popular religious fable that sells? Can we close the gates of Grace and Mercy and padlock them shut with chains a full seven years early? Are we permitted to say, "That's all folks" seven years before the fullness of the Gentiles is brought in? Let us be honest here with respect to our popular church doctrine of a Pre-Tribulation Rapture. Are we being presumptuous and out of line here with this churchy "cut and run" eschatology of ours? Is this a latter day indulgence, a special dispensation of grace dispensed by the church for profit and filthy lucre? Where is the Holy Scripture, chapter and verse, proving the God of Israel has set forth such a notion? And by whose authority do we presume to evict the Omnipotent Omnipresent Holy Spirit from tribulation earth and terminate the dispensation of Grace seven years ahead of time? GRAND FINALE AT THE VERY END OF THIS PRESENT AGE. Dear saints, we can and should be encouraged here. The last seven years of this age, and the Great Tribulation are not all gloom and doom as we have been told. And the wrath of God comes afterward and only on the wicked. Much of what we have been taught we must unlearn. We must align our beliefs with scripture and scripture alone. For example, the prophet Joel tells us that the Holy Spirit outpouring will come to a final glorious crescendo right at the end of the age. Can we believe what He is saying here? Joel saw this final climactic and glorious Pentecostal outpouring at the time of the salvation of Jerusalem at the Battle of Armageddon. He saw it in the time context of the 6th seal cosmic disturbances of a darkened sun and a a bloody moon. - Joel 2:28-32 Therefore we know that this magnificent revival will occur inside the 70th week and in fact will come to a climax at the end of the tribulation period. Just before the Day of the Lord opens up with wrath being poured out on the enemies of God's covenant people we still see the Gospel at work. This blow-out end-time revival will a re-visitation, even an eclipsing, of the Day of Pentecost. Back on that epic day 2,000 years ago our Apostle Peter made special reference to Joel's prophecy and that epic final Holy Spirit outpouring. - Acts 2 Here is that scripture giving us some details of this magnificent story which is still out there in our future. Notice the embedded time reference in Joel's prophecy as he mentions the darkened sun, the moon turning to blood, and the stars falling. These cosmic disturbances are also seen in the Olivet Discourse and Jesus Himself tags this final blaze of glory as coming "after the tribulation of those days". He therefore places it in the time frame of the very last few days of this age. This is before the Day of the Lord opens up and the angels of wrath pluck up the wicked as tares for the fires. Joel goes on to tell us that at the last possible moment, and just before God's wrath falls on the wicked, the call will go out to all mankind one last time to repent and be saved. That whoever calls on the name of the Lord Shall be saved. As the Lord has said, Among the remnant whom the Lord calls. This great revival at the end of this age was also prophesied by others. Hosea prophesied that after "two days", (two millennia), God would revive Israel. Thus the Jewish nation will come to an epic national salvation. In the manner of the classic fireworks festival the Holy Spirit outpouring will climax in a grand finale at the very end of the seven years. This outpouring will not only see the salvation of the Jewish nation in Judah but will also empower the Church to complete the Great Commission. In this same late 70th week time period the "fullness of the gentiles", the end-time harvest, will be brought in. While all this is happening the heathen nations will be raging. And yes these will be awful times for many, this is true. But the covenant people of God will 'rise and shine', for their Light has come. -Isa.60 They will not be ducking and weaving away from the end-time witness. Nor will they be scurrying off like rats to hide as we see in those fictitious characters in the "Left Behind" novels. The Bride of Christ will be clothed in righteous glory of her Father, shining like the sun, radiant in splendor. And like a supernova, the end-time Elect will go out in a blaze of glory! CHOSEN PEOPLE; A ROYAL PRIESTHOOD AND A HOLY NATION. The re-union of the two houses of Israel focusses on Ephraim or his father Joseph and Judah. Ephraim is a handle on Israel for the ten northern tribes of Israel. The Northern Kingdom of Israel rebelled from the royal tribe of Judah went their own way. They ended up in gross idolatry. They were were divorced by God and cast off. - Jer.3:8 They were taken captive by the Assyrians in 722 B.C.. The northern ten tribes never returned to the land of Israel in numbers sufficient to restore their tribal names or their sovereignty in Israel. These are the so-called 'lost ten tribes'. Judah is the royal tribe in the Jewish nation. They too went into idolatry and captivity. In their case it was Babylon that carried them off in 605 and 586 B.C.. They did return to the land of Israel in faith and numbers sufficient to re-establish a sovereign presence in the Holy City. Their temple was rebuilt under Zerubbabel, faith and devotion restored under Ezra, and the gates and walls of Jerusalem were rebuilt under Nehemiah thus securing Jerusalem's sovereignty as a city state. Thus continued the saga of the Jews. In the His priestly office our Messiah is our Sacrifice Lamb and our High Priest. Two millennia ago He came as the prophesied Suffering Servant. But when He comes again as the Lion of the Tribe of Judah, we shall see Him come as a conquering King in His royal or kingdom role. These two offices of Messiah have been a puzzle and a source of wonder for the Jewish rabbis for a long long time. One theory they put forward was that there might be two messiahs. The messiah of the kingdom office they would name Meshiach ben David. The messiah of the priestly office they would name Meshiach ben Joseph. Ben David would be the the messiah as King of Israel. Ben Joseph would be the messiah as High Priest of Israel. As we have seen from scripture, Jesus will fit the bill for both offices quite nicely. He will fulfil both in His two comings. In the fullness of time these two offices of Messiah. in the Order of Melchizedek will have been paraded into holy history by Jesus in the first and second comings of Messiah. A gap of two millennia will have separated them. The first coming of Messiah came on the 10th of Nisan in the year of His passion. Our Lord Jesus entered Jerusalem on Palm Sunday. It was just 4 days before the Passover of His crucifixion. He came to His people in his priestly ministry as the 'suffering servant' riding on a donkey bringing the bridal price in his very life for the betrothal to His Bride and covenant people. This next time He comes it will be quite different. He will return in His kingdom role as a 'conquering King' and riding on a white horse. He will rule in the royal or kingdom office of Melchizedek from the Throne of David. The priestly office and the kingdom office complement each other. In the coming Millennium of Messiah the people and the creation of this world will have the best opportunity that they have ever had to find true happiness. Peace with God will bring peace with their fellow man. And this planet will be restored to order and beauty. Ezekiel saw the kingdom and priestly offices of Melchizedek as well. He saw them exemplified by the two sticks that became one in his hand. Image from Batya Wootten's book. 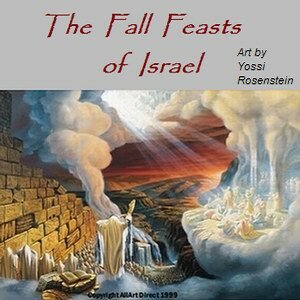 The final reconciliation of all Israel is also laid out for us in the Fall Feasts, the final three of the Seven Feasts of Israel. The fulfilment and culmination of all these seven feasts will finalize the kingdom agenda in Christ, even the 'Gospel of the Kingdom'. The 'Gospel of the Kingdom' is spoken of quite often in the gospels. - Mat.4:23, 9:35, 24:14, Mark 1:14. As Christian believers this mention of 'kingdom' in association with the Gospel sounds strange in our ears. This is because we are so focussed on the priestly burden of the Church which is the spreading of the Gospel of grace. The Kingdom, however, is the place of His rule. He rules first in the hearts of men in the gentle bonds of His love. Later, at His coming, He will minister and rule upon the earth from Jerusalem in the glorious future Messianic Kingdom. Notice that God does not speak of a 'royal nation' and a 'holy priesthood' as we would do today with our inclination, (in Greek logic and mindset), to totally separate and compartmentalize the political and priestly offices of church and state. But rather God, through this message to us from Moses, crosswires the connections between the two virtues and the two offices. the kingdom virtue of royalty He applies to the priesthood. and we have a 'holy nation'. Our Apostle Peter brings us precisely the same message that Moses brought us 3500 years ago from out of the New Testament. This is wonderful news indeed. In the coming Messianic kingdom/priesthood our Messiah intends to thoroughly crossover the royalty virtue of the kingdom or political office and apply it to the Priestly office of Messiah. And He will crossover the holiness virtue of the Priestly office and apply it to the Kingdom office of Messiah. How wonderful! There will be no dichotomies, compartmentalizations, vaticanizations or bureaucratic hierarchies in the Kingdom of God. Every agency of Messiah's Kingdom will be subject to Him and all the offices and anointings will serve each other. and bless and be blessed by Messiah and all His agencies agencies. This is demonstrated for us in the architecture of the New Jerusalem with its 12 gates and alcoves. - Rev.21 Each and all of the 12 gates into the Holy City are unique with their separate identity preserved. Every one of them, including the gate of the royal Jewish tribe of Judah, have privilege of place in the New Jerusalem even as there are 12 stones on the High Priest's breastplate. The Throne of David, which is the place of Messiah's Kingdom rule, will be at the gate of Judah. Indeed, the Apostle John, the writer of the Book of Revelation, saw Jesus as the 'Lion of the Tribe of Judah'. -Rev. 5:5 His kingdom authority will go out from the Gate of Judah into the cosmos. But John also tells us that every gate is a also a pearl. This is even as the 11 brothers of Joseph bowed down to him and to his ministry of salvation and reconciliation. The Bread of Life and the Cup of the covenant are both showcased in the ministry of Joseph. The pearl, the white stone, has a central and special connection to all 12 gates. The 12 gates lead into a common area in the center where Messiah, as the Lamb of God presides. He and all His people from the 12 different spiritual streams commune together in a free and open interchange. And yet they all operate together in perfect unity and harmony. And this is our city! What a magnificent inheritance we have! At the gates of the Holy City. Some more devotional articles on apocalyptic Biblical themes for the enquiring Christian.